Did you catch the story about the 39-year-old San Francisco woman who scored a pair of "tickets" to go to dinner at the "pop-up" of the Pellegrino-rated number one restaurant in the world, Noma? She was lucky enough to score tickets to celebrate her birthday, and she was willing to pay for dinner and drinks for her date. The guy was on the hook for airfare and hotel to and from Japan. Pop-ups are the latest trend in high-end, enthusiast dining in which hot restaurants spontaneously invade off-beat locations. 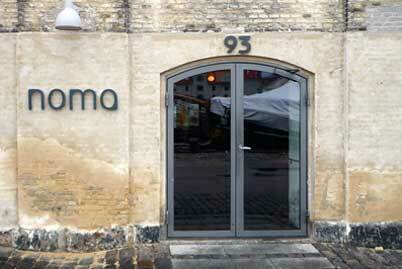 In this case, Noma, a famous restaurant in Copenhagen, popped up on another continent for a one-month engagement that may never happen again. Other Michelin-rated restaurants might do a weekend pop-up in a Chinese take-out joint in the Bronx or an abandoned warehouse in Detroit. There are no real rules or guidelines for when or where a pop-up happens, but foodies love them and support them with rabid enthusiasm. The demand for high-end restaurant pop-ups is unlike anything the audio world ever sees; as a result, there are people who actually pre-pay for their dinner via tickets. In fact, the concept of tickets has become so popular in the world of high-end dining that Ferran Adria's new Barcelona restaurant is actually called Tickets--and yes, you have to pre-pay to eat dinner. Don't show up? Somebody takes your spot, and you are hosed. How about that for creating consumer demand? It's also worth noting that Adria closed his top-notch experimental restaurant El Bulli long before people had grown tired of eating there. Yes, you can get some of the greatest hits of El Bulli at 41 Degrees in Barcelona, but it's an interesting commentary on supply and demand that we wrote about regarding audio companies and limited-edition products a few months back. It's fair to say the audiophile world is stuck in a bit of a rut these days. Stereotypically speaking, brick-and-mortar stores are selling uber-expensive equipment mostly to an aging group of Baby Boomer clients. The number of these stores that can stay viable is fewer and fewer, and nearly all of them are run by Baby Boomers themselves who grow increasingly risk-intolerant as they age. Audiophile stores wait for consumers to come to their often messy salons for extended auditions of complex and esoteric gear, yet little is done to get new people in the front door to hear what music in high definition really can sound like. Other enthusiast businesses--like restaurants, fashion, and beyond--are doing more badly needed outreach, such as pop-ups. Here's a simple fact: more people today love music than ever before. They have more access to music, be it a smart phone, a pile of Compact Discs, or a collection of meaningful 24/192 HDTracks downloads on a player or computer. Beyond the issue of access, the richest people in the world--the ones who can justify the sometimes silly prices that the audiophile world sells their products for--don't always make it into the audio salons of the world. Well, where are these jet-setting, one-tenth-of-one-percenters hanging out if they aren't at Bill and Joe's Emporium of All Things Audio? Perhaps they are at a local FBO (the part of an airport where people fly private)? Perhaps they are at their country club getting ready to play golf or tennis or to have a tasty brunch? Perhaps they are shopping for a high-end piano? Perhaps they are staying at the local five-star hotel? They are out there...it's just a matter of reaching them. Flooring gear is a phrase used in the AV business to describe the cost of purchasing equipment for display, and it's no small cost when you look at the P and L statement of an audio store. A dealer can grind their best manufacturers for generous terms for as long as they can, but eventually they have to pay for the pricy gear that stacks up in any audio store. Why not make the most of said investment from day one? Why not even ask for a little co-op marketing money from your manufacturers and get in the pop-up business? If your brands won't chip in, dump them. I can think of many that will in hopes of finding dealers who can get out of order-taking and into new-school sales. Perhaps some willing brands will comment below? My mentor when I was a very young man, Mark Levinson--a proven genius in the marketing of audiophile gear and systems--was somewhat on to this idea at Cello Music and Film back in the 1990s. He was going to high-end piano stores and lugging the "Cello Baby" system (about $60,000 back in the mid-1990s) in for audition right in the store. His idea of a cold call was to find a woman who just bought a Stradivari violin and invite her and her likely benefactor from Julliard (or some orchestra, etc.) to visit the Cello showroom and record the instrument being played. He did true and highly creative outreach in ways only the top-performing sales people ever do. The rewards were sales that could top $1,000,000 per client, and that was back in the 1990s. Today, I am told Mark has his Daniel Hertz speakers in Vladimir Putin's home. I wouldn't doubt it for a second. What if a local audiophile store asked the most expensive country club for permission to set up a system playing classical, jazz, and some not-too-raucous rock music in the lobby? On Saturday morning, when the regulars come in and see a professionally calibrated Ultra HD TV and hear HD music via a stack of excellent equipment and gorgeous speakers, you have a chance to open a dialogue with Dr. So-and-So or the local lawyer who might not have upgraded his system in years. All fresh leads. All coming from outreach. A virtual audiophile pop-up. Oprah was once quoted in a commencement speech saying that the students should aspire to fly private, as it is the world's greatest luxury. I have had the chance to fly private a number of times, and if you've never had the sweet nectar pumped into your veins, trust me when I tell you that Oprah is right. The problem is, you need Oprah money to fly private all the time. A Marquis Jet Card for 25 hours currently costs $165,000 and needs to be used within two years and is for a pretty small plane. Now THAT is someone who could afford an audiophile system. Is there any crossover between people who fly private and people who love music? I bet there is. If you could get into the FBO that Net Jets or Marquis Jet flies out of for, say, a month of modest rent, wouldn't you be popping up at just the right place? I've seen art dealers do this in Scottsdale. I have also seen wives pack up a $10,000 painting and put it in the cargo hold during the short time that I was in that FBO. Another pop-up success. Luxury brands pay a fortune to be part of the lobby in high-end hotels. In Beverly Hills, one men's clothing company spends $2,000 per month to keep a small display of their gorgeous clothing right near the main elevators. It's just a simple reminder to the $600-per-night-plus guests of the hotel that, IF they were to go shopping, perhaps they could go to this boutique. It would be even better if, during a busy time like the Oscars or Emmys, they had their master tailor on the property to custom-fit people right then and there for their pricey threads. What if, during high tea (at 4:00 p.m. at The Peninsula), the music was carefully selected and played back via a killer system? The old guy who drives his 1930s black Bugatti (I am not kidding, he's a real guy) could possibly pop for a system. How about some awesome headphones, an HD player, and a travel kit? It's a whole new audience, and it's done via pop-up. While not as fruitful as chasing the uber-elite who have money to bur, how about taking a more affordable but still cutting-edge audiophile and videophile system on the road to local music and/or engineering schools? Popping up at these places is a longer-term bet but far more fruitful than leaving the gear just sitting in your showroom, waiting for someone who knows how to buy used on Audiogon.com or order out of state to save tax to call and grind you on price. In 1993 when I was a freshman at USC, Sony brought the first HDTV I ever saw to the Annenberg School of Communications where I was taking a class with the then-Dean. I was floored. Forget that the set was a CRT monstrosity and that the source material looked like fish filmed in a fish tank...I could have watched it all day. We debated the future of video in HD, along with the logistics. I was hooked from then on, thanks to Sony bringing such cutting-edge technology to me at school. Why can't audiophile stores do this? Audiophile dealers tend to hate to spend their own money. Trust me, I've tried to sell them ads, and it is so brutal that I don't even really try anymore. There is an innate entitlement that the phone should just ring with business and that no out-call should be needed. That idea is the root of their systemic failure. All salespeople, myself included, want to be "order takers," but the reality is that, when you do cold calls and outreach, more business comes your way. For those dealers who say they can't afford it, I can think of a number of brands that would reach into their pockets to pay for such a program. They need new clients, too. They need dealers willing to do outreach. They need dealers making money hand over fist the old-fashioned way. Everybody has to eat, thus the demand for restaurants is a little more global than for audio. But one might argue that there are billions of people on the planet who love music and would find value in getting more music into their life. Good music is luxurious but doesn't have to cost a fortune. Good-sounding music is relaxing and benefits one's lifestyle. Great-sounding music is more than a nerdy hobby for 58-year-olds who live in their mother's basement and wear smelly Dark Side of the Moon T-shirts to audiophile shows. Perhaps it's time to bring new people into the world of great-sounding music playback? There's lots of money to be made in the business from the next generation of customers waiting to learn what enthusiast readers of this publication already know: a great audio system is capable of much more than impressing your friends. It's capable of making your life better...and that's a reason to spend the prices that many companies ask for their gear. • Should You Open an Audiophile Bed and Breakfast at HomeTheaterReview.com. • Should Some Audiophile Products Be Sold on a Limited-Edition Basis at HomeTheaterReview.com. • Fantasy CEO: Saving RadioShack From Bankrupty at HomeTheaterReview.com.